Congestion is starting to loosen across the system and rain has ended for the most part, but there are a few tough spots yet. 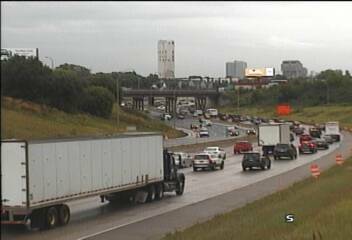 At 8:40 a.m, a wreck is slowing traffic on southbound I-35W at Hennepin Avenue in Minneapolis. It's a ramp jam for drivers on northbound I-35W at the I-494 interchange in Bloomington. Westbound I-494 also remains crammed from Cedar Avenue over to Hwy. 100. Westbound Crosstown is heavy from Portland Avenue to Penn Avenue in RIchfield. It's a 15 minute journey on southbound Hwy. 169 from I-94 down to I-394 due to congestion. In Shoreview, look for brake lights on eastbound Hwy. 10 approaching I-35W. A crash in Eagan where a vehicle spun out and landed on a guardrail on southbound I-35E at Deerwood Drive has cleared.